Back foot batting shots are best used when the cricket ball is pitched on a shorter length (further away from the batter) or when the wicket has a lot of bounce. 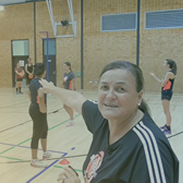 The videos and drills below take your players through the range of defensive and attacking shots (strokes), whether it�s a drive, hook, pull or, if the ball is wide of the crease, a cut shot. If right handed a back foot shot will be played off the batsman�s right foot with a step back toward their stumps. These shots are used to make the bowler pitch the ball at a fuller length and allow less riskier front foot shots to be played.